Shotcrete is a method of placing concrete quickly on irregular surfaces with little or no use of formwork. 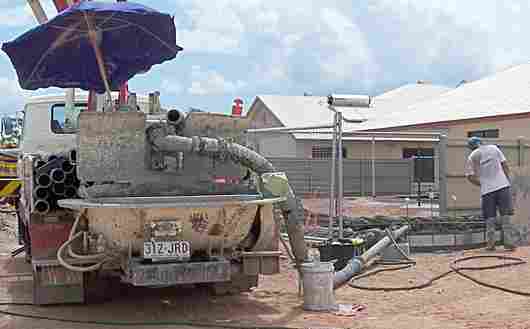 A concrete pump mounted on a truck supplies concrete to the nozzle, at the same time an air hose delivers compressed air, and the mixture is sprayed onto the surface. 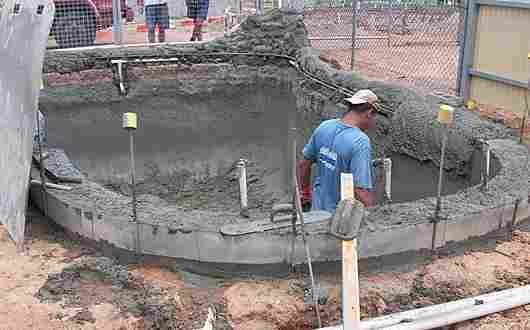 Shotcrete - A small swimming pool being constructed using the spray concrete or gunite method. Note the metal sheets to the left, they are held close to the work, to contain any over spray of material. Shotcrete - The working end, the nozzle. 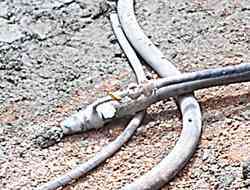 A 75mm concrete hose and a 20mm air hose. Shotcrete - flexible cutting tool and fairly flexible steel float. As with most things in construction there are different names for this process. The original method was invented in the US and used dry materials, that had water added at the nozzle. This dry method came to be known as Gunite. The name Shotcrete started to be used when concrete pumps were able to deliver wet ready mixed concrete to the nozzle. In my experience here in Australia I have only seen wet ready mixed concrete used, but both terms are used, and also the term sprayed concrete. The advantages of spray concrete are fairly obvious from the opening photo. The ability to work free form, using curved wall shapes that would be difficult to form up. On this pool job the concreter uses a flexible steel strip to cut off the rough texture left by the gun. With ready-mixed concrete that has either fibre of steel reinforcement added, free curving shapes can be achieved without complicated rebar setups. In repair and renovation work it is quite often the only way that the job is possible. I have completely replaced concrete beams in sewerage pumping stations that were supporting existing slabs with one side and the soffit formed, and gunite concrete sprayed into the open side. ("Where there's muck there's money lad"). Many civil engineering projects from tunnel repairs to stabilising hillsides and rock faces in road construction would be harder or impossible without Shotcrete. Shotcrete - Concrete line pump. for small jobs like this pool, a large boom pump is not required, the metal pipes have a length of rubber hose that is hauled around by hand. At the back of the truck can be seen the hopper that the transit mixer discharges into. Sat on the right of the hoppers is a highly technical and expensive item, a roughly shaped lump of foam rubber that is blown through the lines with water, at the end of the job to clean them. In my experience most nozzle men have been big strong blokes that can handle the hard work of hauling about the hose filled with concrete and then resist the thrust of the nozzle in operation. He has to have a feel for the job, a good one soon gets to know the stickiness of the mix, how much he can lay on vertical surfaces without it collapsing. On larger civil engineering jobs the nozzle man carries nothing heavier than a remote control unit that directs the Shotcrete nozzle that is supported on hydraulic booms.